With many years experience in the minibus hire industry, Just Bus offers a range of minibus services to customers throughout the region. Established in 1999, the business is located in Pudsey (Leeds). With state of the art facilities and fully qualified staff, the company delivers a professional minibus hire service to both able and disabled passengers. Our services are intended to be cost effective, while enabling customers to travel in safety and comfort. 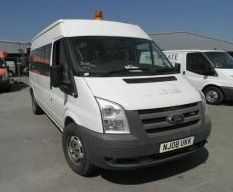 We have a range of minibuses, which are all fitted with all age group seat belts and operate a no-smoking policy. We also have a 16-seater minibus. Click here if you would like to read more about our buses and view some photos. With a close-knit unit of six fully qualified trades people, Just Bus has a professional team, qualified to high standards. Just Bus has an expanding network of clients, located in the local area. The business is owned by Gordon Taylor who has been involved in the transport industry since 1980. Having previously worked for a large blue chip company, Gordon Taylor is more than able to look after the business.